Product code: T820cc Categories: Sold Items, Sold Rings. The whitest and highest colour that a diamond can be is D colour, and here is a magnificent platinum D colour cushion cut diamond engagement ring. So elegantly hand made in platinum, in the centre sits the beautiful GIA certified 1.20 carat cushion cut diamond which is not only D colour but also VS in clarity. The original cushion cut diamond goes as far back as the 1700’s and in recent years has become so popular. Surrounded by eighteen round brilliant cut diamonds and a further eight round brilliant cut diamonds on each side, these additional diamonds total 0.34 carats and not only sparkle magnificently, but also highlight the design of the ring and the beautiful cushion cut diamond in the centre. Platinum is the purest of all the precious metals used in jewellery and retains its pure white colour, so it was the perfect choice to set the whitest of all diamonds into platinum to highlight what a magnificent diamond it is. The top cluster section measures 9mm by 8.2mm and when this ring is on the finger, there is no doubt that it will always be loved, cherished and admired. Tag: Platinum diamond engagement ring. Platinum D colour cushion cut diamond engagement ring. This diamond engagement ring is set with a D colour cushion cut diamond. GIA certified, this makes an incredible diamond engagement ring that will always be loved. Cushion cut diamonds are also known as mine cut or old miners and was used as a diamond cut since the start of the 18th century. Popular in recent years, this cushion cut diamond is D colour which is the highest colour that a diamond can be. Set in platinum and surrounded by round brilliant cut diamonds, there are more diamonds on each band. 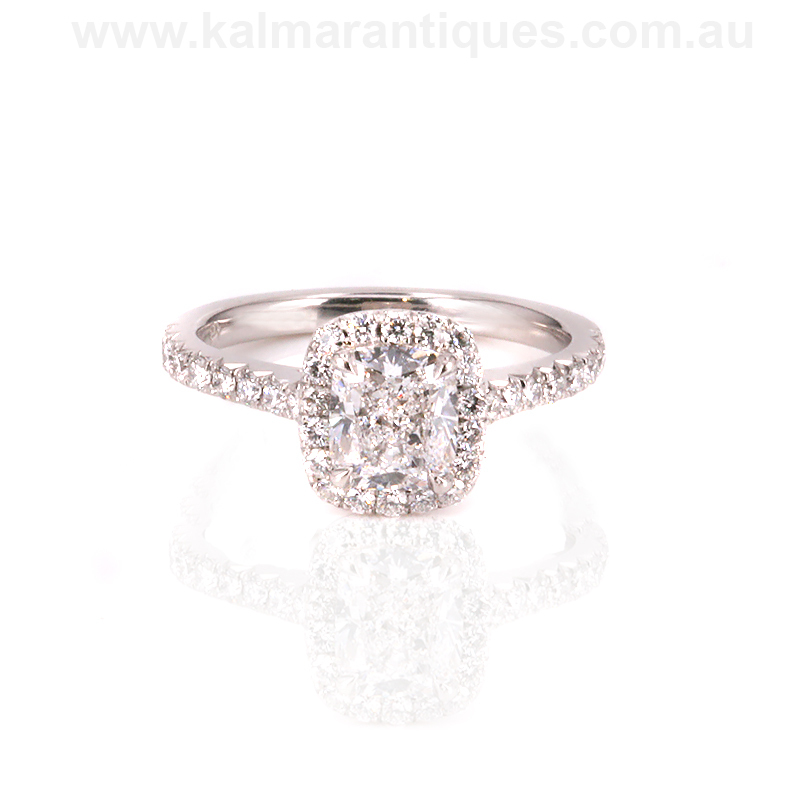 A perfect and very elegant example of a diamond engagement ring that will always be loved and admired.